A well-crafted business succession plan requires careful consideration, which can seem daunting to the devoted business owner who has limited available time. However, when considering the long-term benefits of a thoughtful business succession plan, and the potential risks of not having one in place, it quickly becomes apparent that consulting with qualified advisors skilled in this specialized area of estate planning is well worth the owner’s efforts. Few business owners are comfortable with the idea of their assets passing to the government in the form of taxes. Without an effective estate and business succession plan in place, the government may be entitled to a much larger share of the value of the deceased owner’s business than necessary. This reduces the assets left to the decedent’s heirs, and may require surviving family members to sell the business or other illiquid assets to provide a source of payment for estate taxes. Establishing an effective succession plan during lifetime also reduces potential familial conflict after death, as expectations for the transition of the business have been set, and family members are well provided for. In addition, as discussed in more detail below, where there are multiple business owners, a carefully crafted succession plan can allow for seamless continuation of business management after a co-owner’s death. • Current law sets the federal estate, gift and generation-skipping transfer (“GST”) tax exemptions at five million dollars adjusted for inflation (currently $5,490,000) for each living individual and decedent. The Massachusetts estate tax exemption is set at $1,000,000 under current law. These potential estate taxes can approach a 50% combined federal and Massachusetts rate. • There is an unlimited federal and Massachusetts marital deduction under current law, meaning that married couples can transfer assets to each other free of federal and Massachusetts estate tax during life and at death (assuming the recipient spouse is a U.S. citizen), and free of federal gift taxes. Generally, trusts are used to minimize federal and Massachusetts estate taxes, and to utilize the marital deduction. • The annual exclusion amount allows each person to gift up to $14,000 adjusted for inflation periodically ($28,000 for a married couple) annually to anyone free of gift tax, before consuming any of the donor’s lifetime gift tax exemption amount. With proper advance planning, the federal and Massachusetts exemption amounts can be fully utilized in the estate of each spouse, resulting in significant estate tax savings. How Do I Accomplish My Estate Planning and Business Succession Goals? 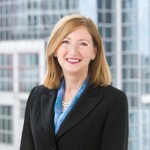 For most business owners, planning goals include preserving the value of the business, ensuring that the surviving spouse and children are able to maintain their lifestyle, ensuring that children are treated equally when not all may be actively involved in the business, and minimizing estate taxes on this valuable, but illiquid, asset. There are multiple strategies available to the business owner in accomplishing these important goals. If a business has two or more owners, establishing a cross-purchase buy-sell agreement obligates the deceased owner’s family members to sell the business interest to the surviving owners. Funding the agreement with life insurance on the life of each owner provides immediate cash to the surviving owner(s) to complete the purchase of the deceased owner’s business interest from his or her estate. 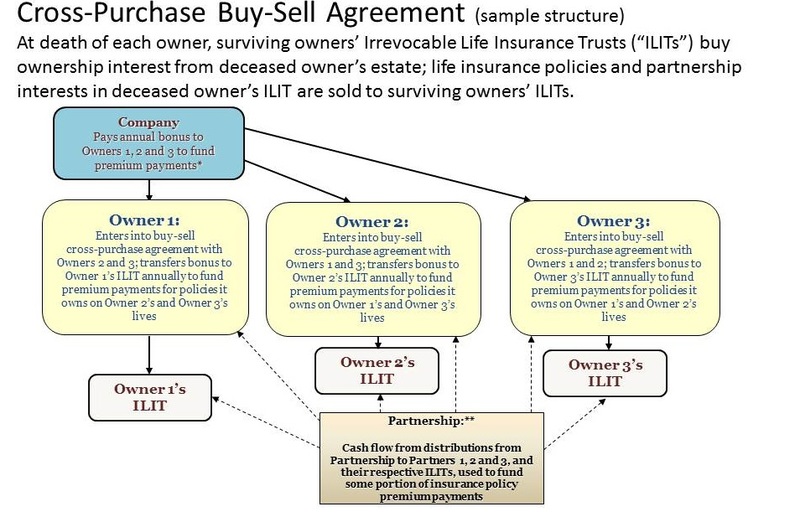 Establishing irrevocable life insurance trusts (“ILITs”) to own the policies significantly reduces estate taxes on the business owners’ respective deaths, and provides ample liquid assets in trust for the benefit of the deceased owner’s surviving spouse and descendants. Benefits of the ILIT structure include enhanced creditor and divorce protection, and shielding the future growth in the business’s value from estate taxes in the estates of the surviving owners. Obtaining an initial valuation of the business to determine the amount of life insurance needed to fund the agreement will be critical to determining the payment terms under the agreement. A combination of insurance death benefit and a promissory note is frequently used for this purpose. It is essential that a buy-sell agreement be coordinated with the owners’ overall estate plans. Specifically, the agreement terms must provide adequate liquidity to fund the purchase of a deceased owner’s business interest, and any transfer restrictions under the agreement should not preclude estate tax minimization planning. In addition, including an equalization clause in the estate plan to ensure that children are treated fairly may be necessary. For an illustration of the basic elements of a buy-sell cross-purchase agreement, please see the flowchart below. Deborah Pechet Quinan is the Chair of RIW’s Trusts & Estates Practice Group. Deborah can be reached at dpq@riw.com or 617-742-4200.